On this date in 1862, German immigrants fleeing Confederate conscription were caught near Texas’ Nueces River and slain to a man. The nomenclature of the “Nueces Massacre” is controversial since this party of Union loyalists making a leisurely pace* for Mexico got its shots off as it was gunned down in a gully by Texas Partisan Rangers in the predawn hours. [S]ome of the more humane of us did what we could to ease the sufferings of the wounded Germans. They had fought a good fight, and bore themselves so pluckily I felt sorry I had taken my part against them. We bound up their wounds, and gave them water, and laid them as comfortably as we could in the shade. Poor creatures, how grateful they were! He then pauses for breakfast and helps gather up the scattered German horses; we rejoin the narration after 4 o’clock in the afternoon. I hurried over to where we had left the German wounded to see how they were getting on, and was surprised to find them gone. Asking what had become of them, I was told they had been moved to a better shade a short distance away. With this answer I was quite satisfied, and never dreamed the brutes with whom I served would be guilty of foul play, especially after the gallant fight the enemy had made. “It can’t possibly be they have murdered the prisoners in cold blood!” I said, not believing that even Luck [a villainous — to the diarist’s mind — lieutenant] would be guilty of such an atrocious crime. “Oh, yes; they’re all dead, sure enough — and a good job too!” Feeling sick at heart, though I hardly even then credited his report, I ran on, and found it only too true. It seems they were asked if they wouldn’t like to be moved a little way off into better shade. The poor creatures willingly agreed, thanking their murderers for their kindness. They were carried away, but it was to the shade and shadow of death, for a party of cowardly wretches went over and shot them in cold blood. More summary justice followed in the weeks ahead against members of the party who had escaped** and others, and Confederate Haengerbande would plague Texas Germans of insufficient southern enthusiasm for the remainder of the war. Fred Shon Powers offers this detailed account of the affair; there’s another here. 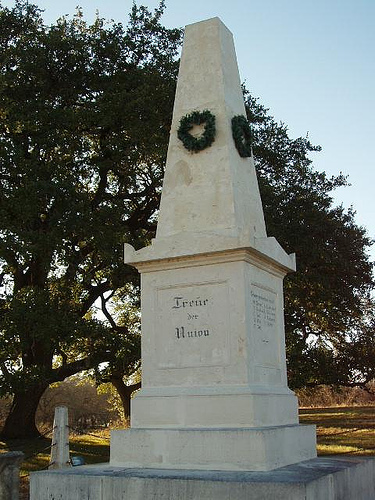 This day’s victims are honored by the Treue der Union obelisk, the only Union monument in Confederate territory, a prominent distinction that (as with all things in the Civil War) invites political football. This conservative article throws cold water on the “Germans-as-antislavery-Unionists” trope, and academic papers from a 1990’s conference gathered in this volume treat Nueces among other topics of “disloyalty” in the Confederacy. The photo is taken by Steve & Marion Daughtry In Comfort, Texas. Image used with permission. ** About half the group had separated from the main body just before the Confederates engaged them. From this number come the “escapees,” many of them later killed in the hills or while crossing into Mexico. Those who stayed put all died this day.